Meyers Gazetteer is the your one-stop destination for placing old Pomeranian cities and villages on a Google Map. It overlays old maps on top of the Google Map, pinpoints church districts and civil registration offices, and is complete with important information from the Meyers Orts- und Verkehrs-lexikon des deutschen Reichs. If you are looking for an alternative resource with topographical maps from the early 1900s, please see the Maps Archive of Western Poland (Archiwum Map Zachodniej Polski). GeoPortOst is a tool that provides access to more than 3,000 maps of Eastern and Southeastern Europe. The focus of the collection is on hidden thematic maps of the history, ethnography and economic and social conditions of the region. In addition, GeoPortOst stores old maps and maps from the 16th to 19th centuries to eastern Europe. GeoPortOst synthesizes the maps with their geodata and their source context into a system for historical spatial information. The Georeferenzierung feature appears to allow for overlaying maps for referencing points and locations. From a historical perspective, it is important to remember that borders changed frequently. Each Kreis gained land or lost some of its territories throughout history. In some cases, a Kreis was dissolved into several other Kreise as was the case with Kreis Fürstenthum. Other times, territories were annexed or joined such as with Kolberg-Körlin, Belgard-Schivelbein, and Franzburg-Barth. 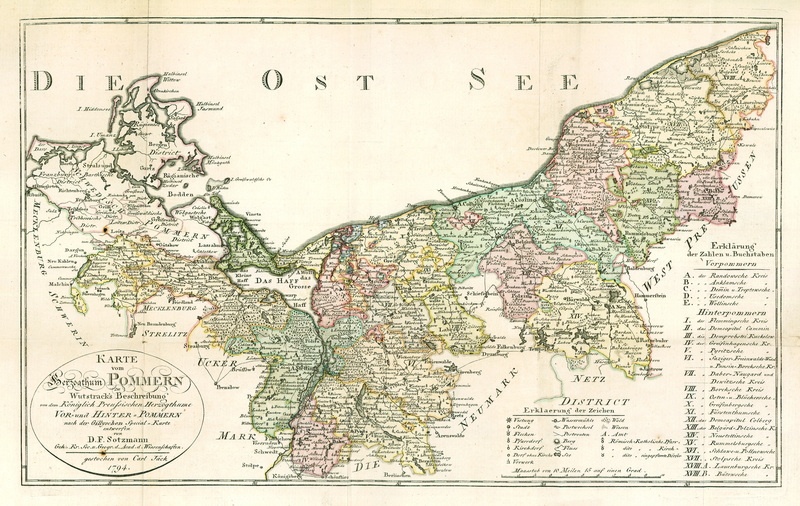 With the addition of former Ost-Brandenburg territories from Neumark, the southern part of Pomerania gained land near Arnswalde and the Kreise in the surrounding area. Wars also allowed other countries to lay claim on Pomeranian territories. Parts of Pomerania were under Swedish jurisdiction while others were directly influenced by Prussian power or under the control of Brandenburg. To fully understand a region, one must research a city based upon its former holders. This is especially true when researching former Neumark territory. Pomerania was devastated by the Thirty Years’ War. The Seven Years’ War also raged throughout parts of Poland, affecting Silesia as well. Veterans of war can be found in or near garrison cities long after war; an example of this can be found in the Belgard church book concerning the deaths several former military members long after they had fought. To understand patterns of migration due to war, it can also be helpful to know where garrisons were stationed. You can read more about garrisons and the canton system at Pommerscher Greif e.V.’s page on the organization of the Prussian army. (While the website is in German, a translation tool is provided in the sidebar.) One might also be interested in reading about the history of the Prussian army in regards to the time frame for mandatory conscription, enlistment, drafting, selection of soldiers in the canton, and earlier times when rulers depended upon hired mercenaries to wage war. It is also important to understand that any peasant, serf, or tenant farmer was not permitted to leave his home city without permission from the ruling nobles and kings. To this effect, after the Thirty Years’ War, families tended to stay relatively close, sometimes never leaving their birth place. It wasn’t until the peasants were freed in the early 1800s in connection with the Napoleonic Wars that subservient populations were allowed to move elsewhere. This can be best demonstrated through older church books that date back to the 1700s. For example, families mentioned in the Lupow church book of Kreis Stolp can be observed living in the same city their entire lives in the 1700s. After the peasants gained more freedom, descendants from the same families spread to other places like Lauenburg, Danziger Höhe, Pumlow in Belgard, Stolp Stadt, Schlawe, Berlin, and other areas in Brandenburg. A list of documents related to these regiments can be found at the Prussian Secret State Archives (Geheimes Staatsarchiv Preußischer Kulturbesitz).